The CSIRO has regions for projecting the impact of Climate Change. See https://www.climatechangeinaustralia.gov.au/en/climate-projections/futur... 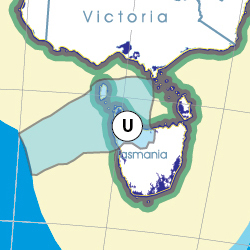 This state, Wonthaggi State (O), is one of the clear projections in a CSIRO cluster called "Southern Slopes region". CSIRO's Southern Slopes region coincides exactly with BloggerMe's T,O,U,V,W. Can miners do the balancing trick? "Anti-mine activists prepare for Tarkine battle http://www.abc.net.au/news/2012-12-19/anti-mine-activists-prepare-for-tarkine-battle/4435324 … @abcnews "
Mass beaching of dolphins, pilot whales around Tasmania's King Island this weekend - over 60 dead. Volunteers now trying to save last whale.